Organic Certified Calendula Baby Cream is one of our most acclaimed products with a well deserved nickname of "miracle bum cream"! Especially formulated for baby's delicate skin also popular with adults. Containing oils rich in Vitamin A, D and E combined with the healing powers of Calendula make this cream very effective in the treatment of all skin ailments. TIP: no need to apply all over every nappy change, so concentrated we recommend a light application to any irritated area only. Great for eczema, nappy rash, chaffing, cradle cap and more. Ingredients Calendula Baby Cream: Distilled Water, *Almond Oil, *Olive Oil, *Sunflower Oils, *Beeswax, *Calendula Oil, *Jojoba Oil, Calendula Extract (organic calendula flowers steeped in Organic *Coconut Oil), Borax (natural emulsifier) Pure Essential Oil Rose Geranium, Lemongrass, Ylang Ylang, Clove, Eucalyptus, Thyme. INCI Ingredients: Distilled Water, *(Almond) Prunus dulcis Oil, *(Olive) Olea europaea Oil, *(Sunflower) Helianthus annus Oil, *(Beeswax) Cera flava, *(Calendula Oil) Calendula Officinalis, *(Jojoba) Simmondsia chinensis Oil, *Calendula Officinalis Extract in *(Coconut) Cocos nucifera oil, Borax (sodium borate) Pure Essential oils (Rose Geranium) Pelargonium x asperum (Lemongrass) Cymbopogon flexuosus, (Ylang Ylang) Cananga odorata var.genuina, (Clove) Syzygium aromanticum, (Eucalyptus) Eucalyptus globulus, (Thyme) Thymus vulgaris. 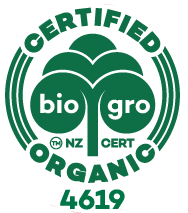 Organic Certification is your assurance that every ingredient is free from synthetic chemical contamination.